The Dubs will also be without Michael Darragh Macauley for their game with Mayo. 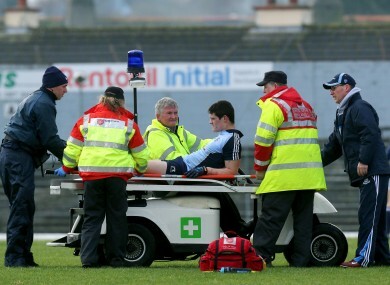 Dublin's Diarmuid Connolly is stretchered off injured during the match last Sunday. DIARMUID CONNOLLY WILL miss Dublin’s upcoming Allianz Football League match against Mayo on 2 March after being ruled out for a month. The forward picked up an ankle injury during his side’s match against Kerry last Sunday. The Dubs will also be without Michael Darragh Macauley for the Croke Park game, as he is suspended, having been sent off in the weekend’s encounter. Denis Bastick, however, is in contention to start, after returning from suspension following his red card in the O’Byrne Cup final against Kildare. Email “Out of action: Dublin's Connolly faces month-long layoff”. Feedback on “Out of action: Dublin's Connolly faces month-long layoff”.